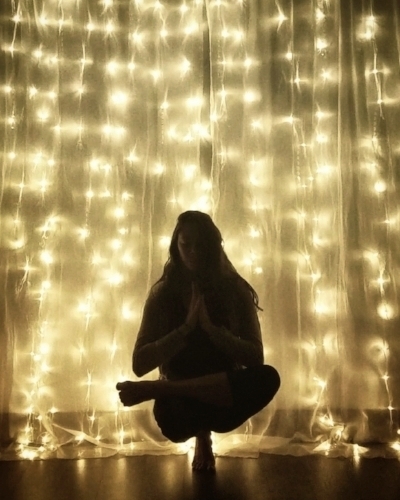 Through mindful movements, controlled breath, and present moment awareness, the ancient practice of Yoga allows you find stillness and in ease in a world so often filled with chaos and noise. Yoga relieves stress, clarifies the mind, and strengthens the physical body, while allowing you to cultivate a sense of tranquility and balance in your every day life, even after you step off of your mat. "Yoga is the control of the fluctuations of the mind"
Practicing yoga teaches us how to quiet the mind's chatter through focused breathing and mindful movements. To help you develop this mind-body connection, I incorporate basic pranayama (breath control) techniques and meditations in all of my classes. From dynamic flows, to beginner's series, to relaxing, restorative classes, my top priority is to make the practice of yoga welcoming, accessible, safe, and supportive for everyBODY. I invite you to experience your own practice so that you can take advantage of all of the benefits yoga has to offer both your body and your mind. in Koh Samui, Thailand in October 2015. My training is based in Ashtanga Vinyasa, with a special focus on pranayama (breath control), kriyas (cleansing practices), and meditation. I teach group and private classes at Excolo Fitness in Plainfield, IL and Universal Spirit Yoga in Naperville, as well as special events and workshops at various locations. For event inquiries click HERE. JOIN THE SUNSOUL WELLNESS COMMUNITY! I respect your privacy, and your information will not be shared.